Located 75 miles from the Chilean capital of Santiago, the *Hippocampus Vina del Mar Resort & Club* has spectacular views of the Pacific Ocean. 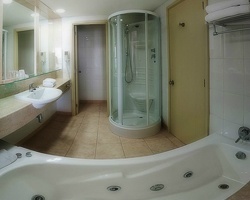 It offers indoor and outdoor pools, a sauna, gym, tennis courts, minimarket, and an international cuisine restaurant. The area has beautiful beaches, and nearby is the famous Casino de Vina del Mar, which presents world-renowned shows throughout the year. The major seaport of Valpara'so, a World Heritage site, is a 30-minute drive, while the ski center of Portillo is a three-hour drive away. Rare resale opportunity at this lovely resort in Chile! RTU until 2026! Enjoy spectacular views of the Pacific Ocean from the resort! Enjoy summer in Chile. Resort has an ideal location since it is close to multiple beaches! RTU until 2027! Buyer May Receive A Title Fee Credit! Great resort with many indoor and outdoor activities! 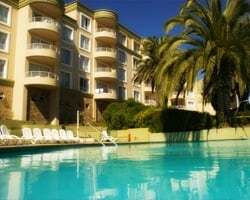 Close to beautiful beaches and Casino De Vina Del Mar! Inquire for details!